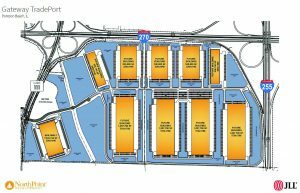 The Gateway TradePort – a new 600-acre industrial park with seven million square feet of institutional industrial space – will begin to take shape this Spring at the intersection of Interstates 270 and 255 in Pontoon Beach, according to NorthPoint Development. Groundbreaking for the development’s lead building, the 540,000-square-foot Gateway TradePort 1, is set for March. The building is to open early the fourth quarter of this year. 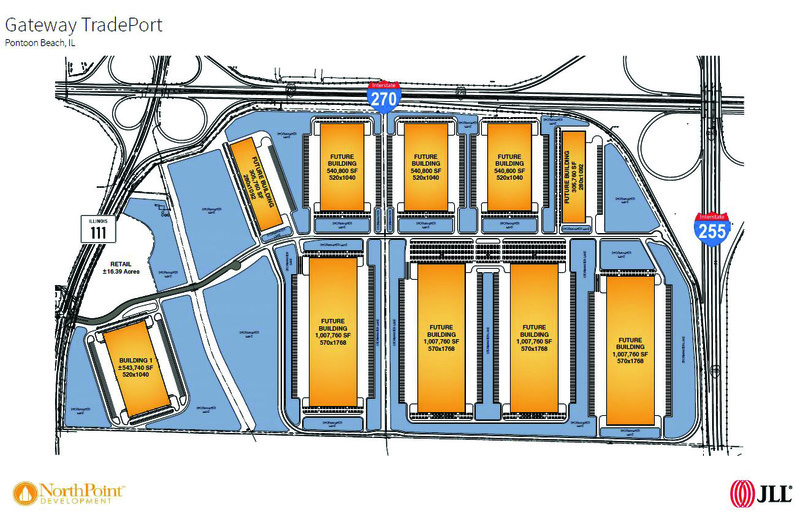 The intersection of I-270 and I-255 has emerged as one of St. Louis’ fastest-growing submarkets; with more than 5 million square feet of new industrial warehouses developed since 2014, according to NorthPoint. The TradePort will be the company’s first development in Metro East submarket. NorthPoint closed on the land purchase for the development in Jan. 31. NorthPoint is a private real estate investment firm that acquires, develops and operates industrial properties across the nation. The firm was founded in 2012 and has developed more than 58 million square feet for tenants such as Chewy.com, Home Depot, Amazon, Walmart, GE, and General Motors. NorthPoint develops industrial and warehousing complexes based on a standard formula of “great location, continuous spec program with flexible building layouts, along with market leading tax abatement for bulk users … ,” said Johan Henriksen, the company’s vice president of development. The Fortune 500 commercial real estate and investment firm, Jones Lang LaSalle Inc. (JLL), is the exclusive leasing agent and marketer for the project. The realtor as operations in over 80 countries and a global workforce of 88,000. Columbia is the ninth safest city Illinois, according the latest annual rankings from The National Council for Home Safety and Security (NCHSS). Waterloo, which was named the “Safest Cities in Illinois” by the NCHSS in 2017, failed to make the organization’s list of the Prairie State’s 112 safest town this year; apparently because of a new ranking system. The Monroe County town had only eight violent crimes last year and only 73 property crimes, the council notes. That equates to 0.772 for each resident of the city, and 7.040 property crimes, according to the group’s analysis of FBI Crime Statistics. O’Fallon ranks 74th on the list with 54 violent crimes during the reporting period for a per-capita violent crime rate of 1.857 and 605 property crimes for a property crime rate of 20.801. Collinsville ranks 82nd, with 55 violent crimes and 610 property crimes last year; for a violent crime rate of 2.246, and a property crime rate of 24.911. Belleville and Wood River just missed the council’s list of the state’s 100 safest cities. Belleville, ranked 101st on the list, had 212 violent crimes last year and 1,386 property crimes; for a violent crime rate of 5.107 and a property crime rate of 33.389. Wood River, ranked 105th, with 31 violent crimes and 401 property crimes; for a violent crime rate of 3.043 and a property crime rate of 39.364. Just beyond the Metro East region, Carbondale ranks 93rd on the list with 135 violent crimes and 868 property crimes; for a violent crime rate of 5.167 33.222. Jacksonville ranks 104th with 73 violent crimes and 669 property crimes; for a violent crime rate of 922 and a property crime rate of 35.939. To identify the safest cities in Illinois, the council reviewed the most recent FBI Uniform Crime Report statistics; issued in 2017, for a total of 7,639 cities, with populations ranging from 7,639 to 4,007,147. Cities that failed to submit a complete crime report to the FBI are not considered. Only cities with populations of 10,000 or more are ranked. Violent crimes are defined in the FBI as those offenses that involve force or threat of force; such as murder or attempted murder. Property crime includes offenses such as burglary or motor vehicle theft in which the object is the taking of money or property, but there is no force or threat of force against the victims. To arrive at their rankings this year, the group considered both the combined violent and property crime rates for cities and a new “police adequacy” factor – the ratio of total crimes in the city to the number of police department employees. Last year, Waterloo ranked fourth on the list and Columbia and ranked 19th. The Illinois Department of Public Health (IDPH) cited five Metro East area nursing homes for serious violations for the state Nursing Home Care Act during fourth quarter of 2018, according to an activity reports posted Jan. 24 to the IDPH’s website. All five were cited for “A” violations which pertain to “a condition in which there is a substantial probability that death or serious mental or physical harm will result, or has resulted according to the report. Granite Nursing, an 86-bed skilled care facility located at 3500 Century Drive in Granite City, was fined $25,000 for failure to ensure oxygen therapy and saturation monitoring were provided as prescribed, as well as $4,400 for two “B” violations for failure to provide supervision, safe transfers, a fall prevention plan, and appropriate catheter care. Rosewood Care Center of Alton, a 180-bed skilled care facility located at 3490 Humbert Road in Alton, was fined $25,000 for failure to identify, asses, monitor, and treat pressure ulcers. Swansea Rehab and Health Care Center, a 94-bed skilled care facility located at 1405 North Second St. in Swansea, was fined with $25,000 for failure to provide care according to accepted standards of practice. On the outskirts of the Metro East area, White Hall Nursing and Rehab Center, a 119-bed skilled care facility located at 620 West Bridgeport St. in White Hall, was fined $25,000 for failure to develop/implement effective care plans to prevent falls, to ensure safety devices were in place, and to provide adequate supervision for safe transfers. In a sign of the times, the old Edwardsville Moose Lodge — a cultural mainstay of the World War II generation — has become a “co-working” space, a millennial icon. Instead of an old-fashioned bar and poker tables, The Lodge now offers 24-hour access to fully equipped work stations as well as a conference room, cafe with craft beer on tap and coffee, copy machine, a lounge, commons area and a “quiet room” for private phone calls. Co-working spaces are designed to offer private working spaces in an open space that allows for networking and collaboration with peers, according to the developer. About a quarter of the building is being reserved for future renovation and facility expansion, based on member needs. For more information see www.thelodgeworks.com. 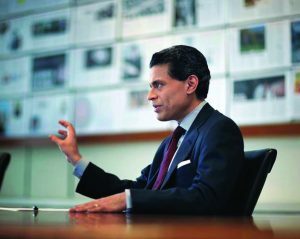 CNN television news host Fareed Zakaria will be the featured guest speaker for the Mannie Jackson Center for the Humanities Foundation’s Fourth Annual Fundraiser Dinner, Tuesday, March 26, at The Commons on Lewis and Clark Community College’s Godfrey Campus. Best known for his Fareed Zakaria GPS (Global Public Square) program on CNN’s U.S. and Worldwide networks, Zakaria and is also a columnist for The Washington Post, a contributing editor for The Atlantic, and a bestselling author. His New York Times bestselling books include: “In Defense of a Liberal Education,” the international bestselling “The Post-American World” and “The Future of Freedom,” a study of “illiberal democracy” in various countries, also an international bestseller. Prior to his tenure at CNN, Zakaria was editor of Newsweek International, managing editor of Foreign Affairs, a columnist for Time, an analyst for ABC News, and the host of Foreign Exchange with Fareed Zakaria on PBS. Zakaria serves on the boards of the Council of Foreign Relations and New America. The program will begin at 6:30 p.m. and doors will open at 6 p.m.
Tickets, which include dinner and a program, are $200 each and are available online at www.mjchf.org/zakaria.